Kistler Group, global provider of dynamic measurement technology, has announced the launch of KiXact. This is the first technology that enables measurement uncertainty to be reliably and automatically calculated and interpreted intuitively by the user. Up to now, for reasons of time or cost, many measurement engineers have completely dispensed with determining measurement uncertainty. This is because the calculations are complicated and time-consuming, and the results often difficult to evaluate. With KiXact, Kistler is now offering a solution that makes it much easier for users to deal with the uncertainty of measurement. Kistler has been supplying engineers, researchers and measurement technicians with the appropriate technology for demanding measurement tasks for decades. Based on this wealth of experience, the company has succeeded in developing a simple, precise and fast solution for calculating measurement uncertainty. As part of the KiDAQ data acquisition system, the KiXact technology automatically calculates measurement uncertainty. The results can be analysed using the KiStudio Lab software provided. External influencing factors such as ambient temperature and humidity for the respective measurement are stored in the program and included in the KiXact calculation. Because Kistler supplies the complete measurement chain, KiXact is already optimally adjusted to the relevant setup and associated sensors. KiXact thus offers customers from different areas an uncomplicated solution and can deliver more than just a tolerance interval. The analysis recognises early which factors in the measurement chain are influencing the measurement, giving operators the opportunity to adjust parameters accordingly. This results in more meaningful measurements of higher quality and with less uncertainty. An uncertainty of measurement is not an exception – every measurement result in research and industry is associated with a certain degree of inaccuracy. Even small fluctuations in the ambient temperature can lead to deviations that make the result unreliable and unusable. Whenever decisions are based on a measurement result, it is important to have an indication of the quality. Thus, the knowledge of the respective measurement uncertainty is indispensable in achieving meaningful results. The more components the measurement chain contains, the more complex the determination of uncertainty becomes, as every potential influencing factor needs to be considered. Up to now, it has been necessary to review the respective data sheet for each possible source of uncertainty, check individual specifications and – in addition to external influences – include them in the calculation. Both the calculation itself and the subsequent evaluation of the data require extended specialist knowledge and a great deal of experience. This procedure requires a considerable effort. To keep the measurement processes economical and manageable on the one hand, in many cases generous assumptions are made or the calculation of the uncertainty is even omitted completely. On the other hand, if an excessive allowance is made for the uncertainty, this has a negative influence on the cost-efficiency of the entire process. Where measurement uncertainty can be reliably determined, tolerance limits can be defined more narrowly, and the process is more efficient as a consequence. 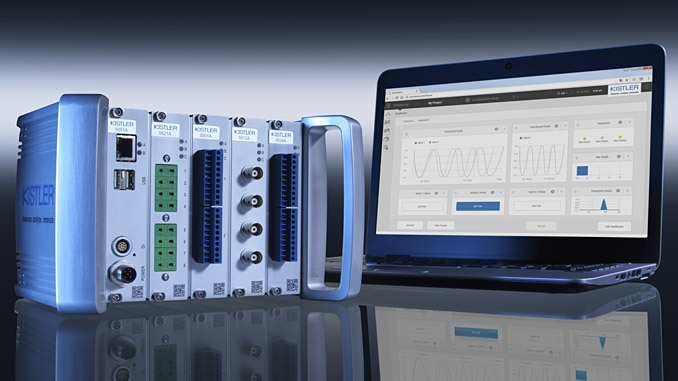 The KiDAQ data acquisition system is modular in terms of both hardware and software. Kistler offers a wide range of measurement modules as well as various analogue and digital inputs. The modules are available in three different housing variants. As a result, they offer the user maximum flexibility for every measurement task. Multiple measuring devices can be combined and are precisely time-synchronised. Furthermore, the measurement platform based on cloud-technologies enables extensions for future applications, even through partner companies.